Jacob Erig (better known as Jacob Ehrig) was born in Pennsylvania. According to the History of the counties of Lehigh and Carbon, in the Commonwealth of Pennsylvania. Philadelphia: Everts & Richards, 1884, page 133, he was the High Constable of the City of Allentown as early as 1848 and later became Allentown's first Police Officer in 1854. 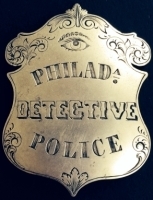 A July 31, 1997 article in Allentown's Morning Call newspaper stated the following, ""It was on Nov. 6, 1854," says [Lehigh County Historical Society curator Andree] Mey, "that the council named Jacob Ehrig Allentown's first policeman." On New Year's Eve 1854, he arrested Charles Henry. 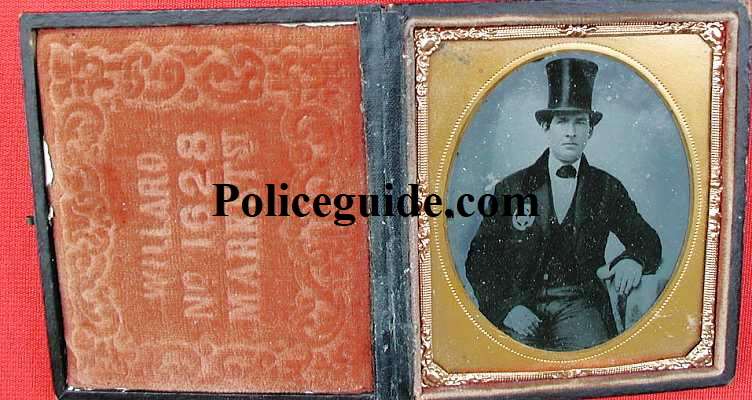 On Jan. 2, 1855, Henry sued Ehrig, apparently charging false arrest. Mey was unable to discover how the case turned out." The following is found in Proceedings and papers read before the Lehigh County Historical Society, Volume 1 (1908), page 178, "But of all I remember the High Constable Jacob Ehrig. He wore no blue coat and cap, he never told us whether he carried a pistol; but the boys of that day well remember the immense cane, with heavy crook, which the constable carried. He was respected by the citizens, and boys, who behaved, had no occasion to run when he was on the march through town; they could stop and inspect the officer's make up." Based on U.S. Federal Census sheets and Allentown City directories, we know that his wife was Caroline and they had a son Uriah J. Ehrig born 1851. He lived at 636 Chew Street in Allentown where, in 1880, he served as tax collector. He was still living at this address in 1891. His son Uriah was also living there with his wife Lillie M. and was a newspaper printer foreman for the Chronicle & News. Jacob died 2-22-1893 and is buried in the Union Cemetery. There was another Jacob Erig from Bethlehem, PA. In 1900 Jacob, his wife and a 19 year old daughter Lizzie lived at 118 North New Street in Bethleham, Pa. and Jacob worked as a Railroad Watchman. Not the same man. "Presented to Jacob Erig by his friends as a testimonial of respect." 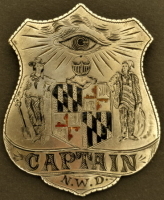 This badge came with the ambrotype photo pictured below of a police officer wearing a similar badge. 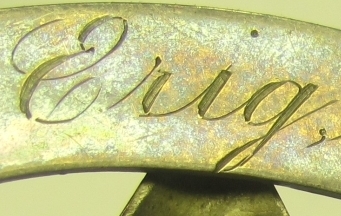 The Philadelphia photographers name and address appear on the left inside of the case. (folded point star) circa 1876. Considered rare. 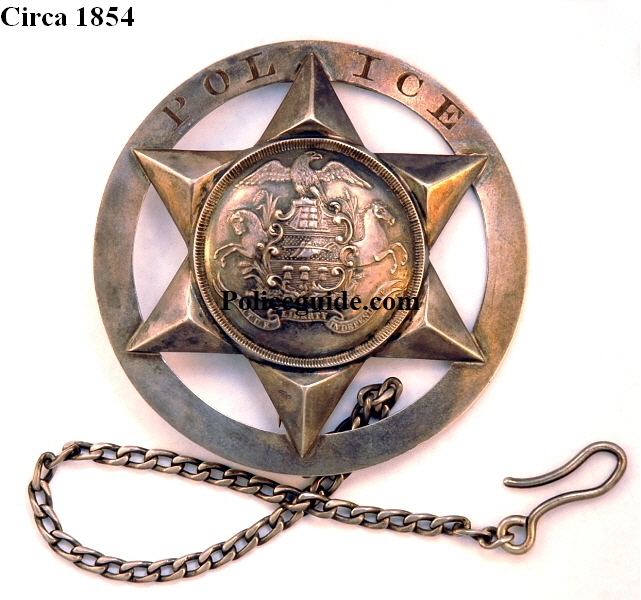 1st issue Borough of Throop, PA Police badge, (folded point star) circa 1894. Considered rare. 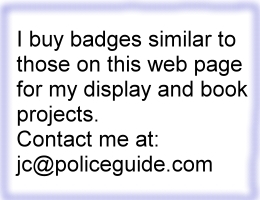 In 2006 the department is only up to 5 officers. Throop was part of the Borough of Dickson City prior to it's incorporation. Jersey Shore, PA High Constable badge. 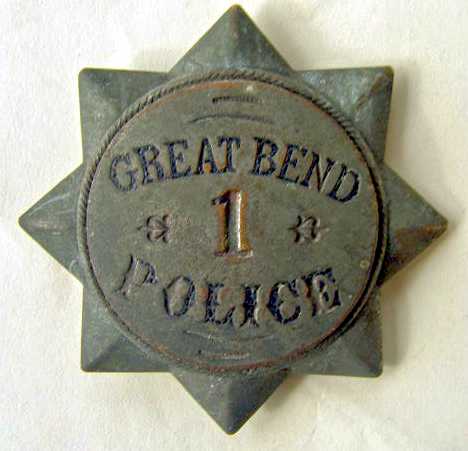 Lebanon, PA Police badge #8. 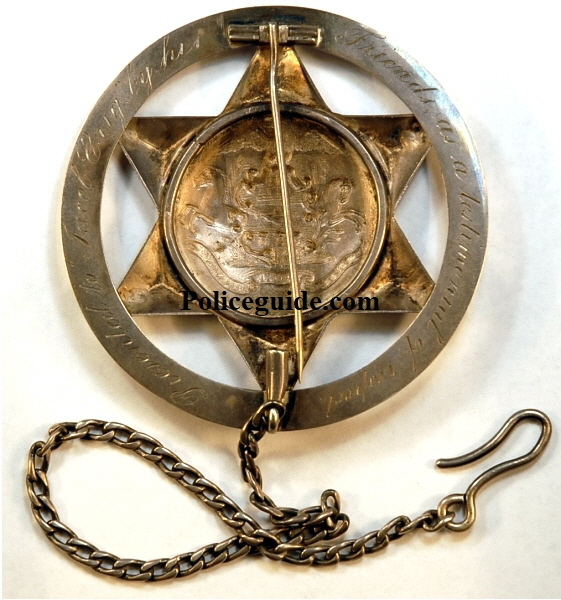 Rare police rattle made by Bagshaw & Field Phila. which manufactured from 1891 - 1931 in Philadelphia, PA. Walter Bagshaw was working in Philadelphia as early as 1866. Bagshaw & Field are known for making tools..
(folded point star) circa 1875. Considered rare.